Tis the season for sandals, my lovelies. So rack up the appointments for pedicures and let the great sandal shop commence. This season we are seriously spoilt for choice when it comes to footwear. And I'll just say up front that I'm towing the line for ladies of all shoe sizes. At the moment I'm squaring into a UK 9 US 11, and yes, that can be difficult to shop for. However, it's no longer impossible. 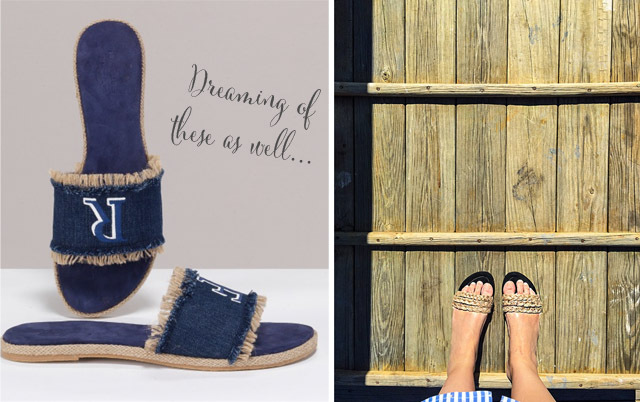 I'll kick off the great sandal slide with a brand that I've loved for years and a collaboration that seems like the world's most fabulous combination of talents. 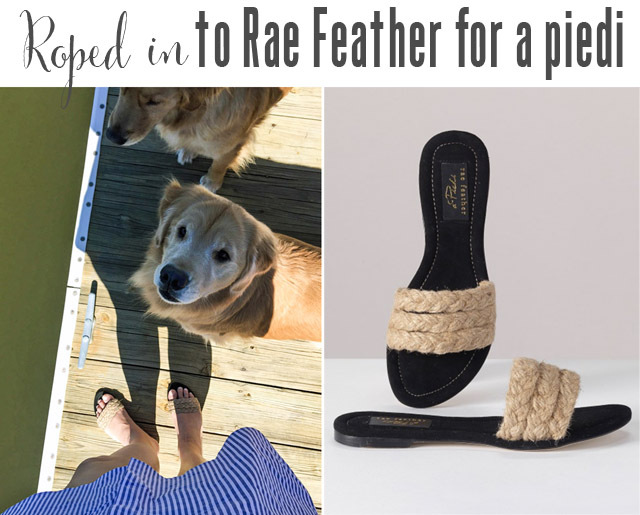 This is Rae Feather for a Piedi. These two brands bring fabulous products to the market every season, but their recent teamwork has come to see a product line be born that can no longer be ignored. It's all about slides for the duo and it they even come with a personalizing element! The monogram fray denim slide is the thing of dreams. Just saying! In the pics above, Boomer is helping me model the Plaited Rope Slide (in a size 9, hallelujah!) and I am not doing to justice with these pictures, trust me, hence the inclusion of the product image. Everywhere I wear these beauts, I am constantly asked where they're from. Well, now you know. And as G.I.Joe used to say, "knowing is half the battle."